Our machines are maintenanced regularly and we take pride in providing top quality equipment. All of our frozen drink machines are two sided. That means TWO frozen drinks for the price of one. We have over 30 flavors to pick from. 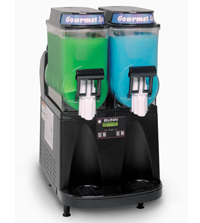 The two flavors provided with every rental make 6 to 10 gallons. Our mixes are nonalcoholic. Simply add the alcohol (or not) of your choice and plug it it! * Indicates that it makes 5 gallons per bottle, All other flavors make 3 gallons/bottle. The full mobile Kegerator System will ensure that every beer throughout the entire event is ice cold. Plus, you avoid the hassles of pumping.